The Centre for Social Justice, Equity and Transparency (CESJET) has said that the war being waged against Boko Haram terrorists is still on course. The group said it will therefore mobilise 20 other local and international NGOs to embark on a tour of Sambisa Forest, the North East and other parts of the country to ascertain the level of success in the counter-insurgency war, as well as troops' responsiveness to emergency and the current state of affairs of the various operations being carried out by the military. Addressing journalists in Abuja, Joyce Ogwu the CESJET Executive Director, said it is the group's belief that the outcome of the tour will offer insight that would dampen the distraction currently placed in the path of the military. She said this is imperative because of the need to allow the military focus on totally ridding Nigeria of terrorism under whatever guise. The group while also reacting to the various reports in the aftermath of the recent adoption of 110 schoolgirls from Government Girls Science Technical College (GGSTC) Dapchi, Yobe State, cautioned individuals or politicians to desist from attempting to make political gains from the tragic incident which they believe was masterminded by a faction of Boko Haram to detract troops from bringing down their last abode in the north-east. She said the attack by the terrorists is a desperate attempt to continue to remain relevant using propaganda as the last tool after troops decimated them into near insignificance and being used as a shield by enemies of Nigeria who wanted to see the country fail. “ the devious purveyors of falsehood that are milking this tragedy are creating the impression that the counter-insurgency war has halted or has failed in the aftermath of the attack on Government Girls Science Technical College (GGSTC) Dapchi. "We have found such claims to not only be untrue but also mischief at its height. Our concern is that such manipulation of reality is calculated to boost the morale of Boko Haram terrorists to regroup from their defeat. They had earlier scattered into the desert and neighboring countries after the Nigerian Army dealt them crippling blows but are now being given confidence by those that are exploiting the Dapchi girls to instigate the terrorists to come back together. We are seeing a repeat of strategies earlier deployed by Boko Haram come into play all over again." She stated that the war against insurgency is very much on course and President Muhammadu Buhari still deserves commendations for all that have been achieved in this regard. Ogwu said while the Dapchi Girls' kidnap is unfortunate, it is important to point out that it is still an isolated incident. 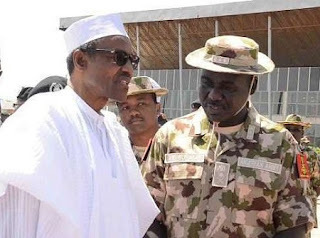 She said, "Unlike the series of attacks in the past that showed the display of helplessness by the military, the Nigerian military has continued to maintain recovered grounds. It is apparent that those peddling negative stories about the war on insurgency do so because they believe they can instigate Nigerians to force the military to divulge full details of its strategy in the counter-insurgency war because there has been reported changes in the approach adopted against the terrorists. "We appeal to Nigerians not to relent in supporting the military. Many of the instances that Boko Haram attack soft targets can actually be averted through prompt and reliable information sharing. "